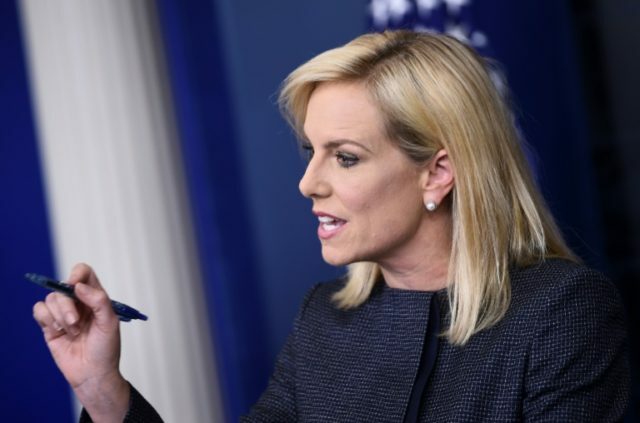 One of the activists who chased Homeland Security Secretary Kirstjen Nielsen out of a Mexican restaurant in Washington, D.C., Tuesday night is a career employee of the Justice Department, according to reports. The employee is Allison Hrabar, who began working at the DOJ in July 2016. She participated in a demonstration against Nielsen during her meal along with the D.C. chapter of the Democratic Socialists of America, according to the report. Hrabar is a paralegal with the Justice Department. She defended her behavior as “off government time” and being within her First Amendment rights, according to the Washington Examiner. However, a review of Hrabar’s Twitter account at @allisongeroi — which is now locked — revealed she was tweeting through her workday and openly celebrating the demonstration Tuesday night. “Keeping families together in jail is not an acceptable solution,” Hrabar tweeted Wednesday afternoon at 1:56 p.m.
Hrabar’s tweeting could run her afoul of the Hatch Act, which prohibits partisan political activities by federal employees during work hours. Federal employee behavior has come under scrutiny recently, after Justice Department Inspector General Michael Horowitz last week revealed text and instant messages of FBI employees showing bias against President Trump. Horowitz referred five officials to the Office of Personal Responsibility for review and potential disciplinary action and recommended that DOJ employees undergo basic training to avoid the appearance of bias.